How can you open your analytics program to all types of programming languages and all levels of users? And how can you ensure consistency across your models and your resulting actions no matter where they initiate in the company? With today’s analytics technologies, the conversation about open analytics and commerical analytics is no longer an either/or discussion. You can now combine the benefits of SAS and open source analytics technology systems within your organization. As we think about the entire analytics life cycle, it’s important to consider data preparation, deployment, performance, scalability and governance, in addition to algorithms. Within that cycle, there’s a role for open source and commercial analytics. For example, machine learning algorithms can be developed in SAS or Python, then deployed in real-time data streams within SAS Event Stream Processing, while also integrating with open systems through Java and C APIs, RESTful web services, Apache Kafka, HDFS and more. 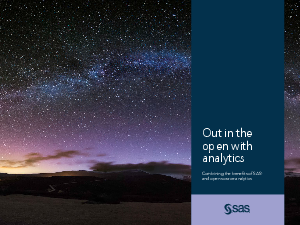 In this e-book you’ll learn how organizations in many industries are using open source analytics and SAS, getting the most from both, and what role SAS plays throughout the analytics life cycle.